We have already talked about some Halloween activities that your primary students will love, but there is also a wealth of activities out there for teenagers. Just type “Halloween activities for teens” in your internet browser and you’ll know what I’m talking about. Is this just another blog post with a compilation of links? No, it isn’t. Here you will find practical teaching ideas, which require little preparation time. If you have a big class, I suggest that you divide the students into smaller groups depending on their likes or skills. If your class is small, then just let them choose from the following activities, which can be adapted to all levels in secondary education. 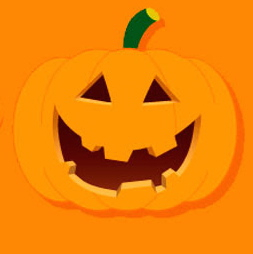 Before students start to work in groups, it is important that they all start by doing an introductory activity such as “How much do you know about Halloween?” At this point, your teenage students should already know some vocabulary, traditions and history related to this festivity, but how good is their knowledge? Here are a couple of ideas to check your students’ background knowledge. Kahoot: create one or use an already made one around Halloween. This Kahoot, for instance, contains a quiz about this short video on the History of Halloween (registration required). Pasapalabra: based on the popular Spanish TV game show, use each letter of the alphabet to ask vocabulary or topic-related questions. Here’s a simple ready-to-use template (registration required). Now, each group will choose one of the following tasks. For all of the activities, make sure your students use the vocabulary and ideas from the previous sections. Create a digital poster. Each member of the group will find typical Halloween dishes. After, they will have to 1) list the ingredients 2) make a video explaining the preparation (they can just pretend or actually make the dish!). The students will post both tasks on a digital poster, which they can easily create with Thinglink. Here’s an example (on a different topic). Create a horror story. Students continue a scary story. As a prompt, you can use any of the following classic novels: Strangers on a Train, The Black Cat, The Phantom of the Opera, etc., (more examples here). If there are any strong writers in your class, they can upload their stories to Wattpad or Creepy Pasta. Both sites are popular among teenagers for reading and writing narratives. This is a great opportunity for students to do something in English for a real audience. Remember: the text has to be grammatically correct and without spelling mistakes! Create a book trailer. The students have previously read a frightening story in class (for instance, Pearson English readers). Now it’s their turn to create a book trailer. Here’s a tutorial of how to create a book trailer. Videos can be uploaded to SchoolTube. Idea: this task fits perfectly after doing task number 2. Create a comic. After reading one of the previous stories or watching a short horror movie fragment, students will use Dvolver, a movie maker tool to create comics. They can select the background, type of scene, characters, etc., and type in their lines. Here’s an example. Similar to Dvolver is The Zimmer Twins story maker webpage. Students can create a story ending or a story from scratch around these two characters, the twins, and a cat called “thirteen” (example). Other easy-to-use comic creator pages are Pixton or Chogger (no video, though, just regular comic strips). Dub the story. Teenagers love dubbing short clips and even shy students are eager to participate. It’s a way of incorporating vocal expression and language to scenes. Take one short animated video clip with or without sound (if there’s sound, just turn it off). Here’s an example of Japanese students using a Pixar animated clip. But if you are looking for a more appropriate clip for this time of the year, here are some Pixar-like short animated creepy stories that students can use to voice over: Alma or Teddy’s Nightmare. But if those videos give you the creeps, students can also watch one episode of the series The Adventures of Billy and Mandy, which teens love. Here’s The attack of clowns episode, a humorous approach to scary clowns. When dubbing, students can do it in front of the class or use a screencasting. A day in the life of…. Students choose one famous scary movie or novel character, such as Jack the Ripper, Freddy Krueger, Dracula, Frankenstein, Hannibal Lecter, Chucky, etc. After, they will have to describe a normal day in the life of this character. How? Students will take screenshots of routine actions and create a multimedia slideshow. With VoiceThread, for instance, you can easily create an audio slide show. An alternative is to choose one famous animated character (Ghostbusters, Hotel Transilvania, for instance) and record a message explaining the character’s daily life. This can be done with Zoobe (with in-app purchases), which will match the animation to your voice (example). Create a tutorial (how to crave a pumpkin, how to trick or treat, how to design your own Halloween costume, how to ward off evil spirits, etc.). Students write their scripts and decide how to present their tutorial (sticky notes, apps, slides, etc.). Then, they record a video and upload it to SchoolTube, for instance. Finally, they show it to the class, which will vote for the best tutorial (in case several groups are participating). Alternative: students watch a tutorial on the previous topics and have one week to learn how to do something. After, they will show what they have learned to the class (through a video, class presentation, etc.). Here’s a useful webpage to create tutorials. Finally, after students have presented their work, you can have a peer evaluation task and ask your teenage students what they have learned from others. If you are fond of games, create a Jeopardy with any of these templates, or finish the session with a joke competition! – Halloween masks! – Boo! This entry was posted in Culture, Ideas for Class, Onine resources, Teaching Teens, Teaching Younger Learners and tagged Halloween, Ideas for class by Brian Engquist. Bookmark the permalink.